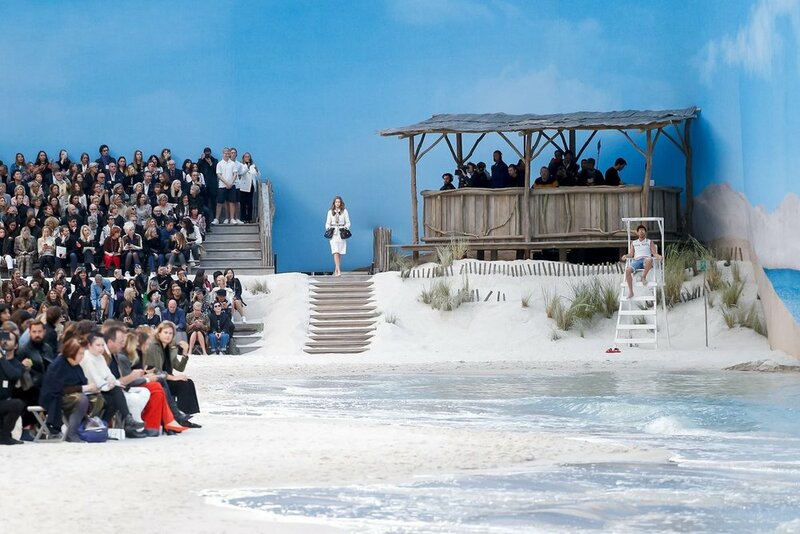 It really hit that the set at Chanel is officially more interesting than the clothes when that morning, my feed spat out post after post of attendees posing with the backdrop, and far less so of looks. These included Bergdorf Goodman SVP Linda Fargo, Porter Editor-in-Chief Lucy Yeomans, Elle Editor-in-Chief Nina Garcia, Instagram’s Eva Chen, fashion critic Tim Blanks, and ManRepeller’s Leandra Cohen, along with a number of other guests, and many a beach pun. Another elaborate set was Christian Dior SS19, which was complete with dancers, because creative director Maria Grazia Chiuri “took great inspiration from the work of a number of artists….who used dance as a way of breaking free," as told to Vogue. They danced atop a giant box – which took a team of 60 people two weeks to build. The project was led by set designer and longtime Dior collaborator Alexandre de Betak, and the square box was both a runway and a stage, with a performance by Israeli choreographer Sharon Eyal lasted for the duration of the show. There certainly seems to be a rise in highly theatrical sets, which is largely thanks to the need to create compelling images for Instagram - the industry’s leading press channel. But if creative directors start leaning too heavily on set artistry to trigger positive reactions about the show, does it only alleviate that crucial tension required to deliver a fantastic collection? Does an elaborate fashion show add to the delivery, or does it distract from the clothes? I first tried to check my biases. I haven’t been a fan of Dior or Chanel for quite a long time. Perhaps I was only noticing this tendency here due to selective attention, and didn’t mind it so much, at say Alexander McQueen’s shows, or at Balenciaga with their pyrotechnics. But no. The intensity of the design at Balenciaga SS19 matched the intensity of the set. Ditto for McQueen. Perhaps it just doesn’t work when the set overshadows the clothes. To align with the theatricality of Chanel and Dior, perhaps we would had to resurrect the house founders. In our polls, it seems the large majority of you agreed (82% of 393 respondents). I also thought back to what fashion shows that I have attended stood out most in my mind, and any specific memorable moments. It was always about the clothes rather than the set, and the particular visual details was always something nuanced and random, such as the way a piece of orange ribbon curled and sashayed behind a model as she walked down the runway at Haider Ackermann SS16, for example. Music is also often part of the memory (The Mirror” by Damaged Bug at Saint Laurent SS16 is burned into my brain), but as this is an auditory element, it does’t compete for the attention of the eye, and thus is always complementary. In any case, it always goes back to balance, and maybe also a fresh approach. What would be most interesting is to see Chanel at a venue other than the Grand Palais. And maybe without tweed.